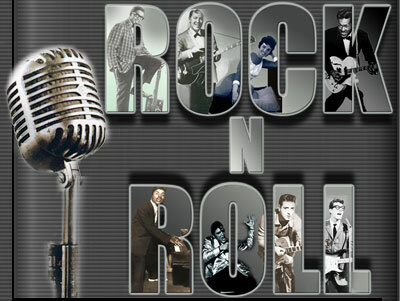 Rock and roll originated in the United States in the 1950s and quickly spread to the rest of the world. Racists attacked rock and roll because of the mingling of black and white people. Rock and roll emerged as a defined musical style in America in the 1950s, though elements of rock and roll can be seen in rhythm and blues records as far back as the 1920s. Early rock and roll combined elements of blues, boogie woogie, jazz and rhythm and blues, and is also influenced by traditional folk music, gospel music, black and white, and country and western. The massive popularity and worldwide scope of rock and roll resulted in an unprecedented level of social impact. Far beyond simply a musical style, rock and roll influenced lifestyles, fashion, attitudes, and language. The heart of rock and roll is the beat. This beat is basically a boogie woogie blues rhythm with an accentuated backbeat, almost always on snare drum. Rock and roll is typically played with two electric guitars (one lead, one rhythm), an electric bass guitar, and a drum kit. Keyboards are a common addition to the mix. In the rock and roll style of the early 1950s, the saxophone was often the lead instrument, replaced by guitar in the mid 1950s. In the earliest form of rock and roll, during the late 1940s, the piano was the lead instrument, and indeed, among the roots of rock and roll is the boogie woogie piano of the big band era that dominated American music in the 1940s. For many years and probably centuries previously, the term "rocking and rolling" had been used as a nautical term to denote the side-to-side and forward-and-backward motion of ships on the ocean. Rocking was a term also used by gospel singers in the American South to mean something akin to spiritual rapture. 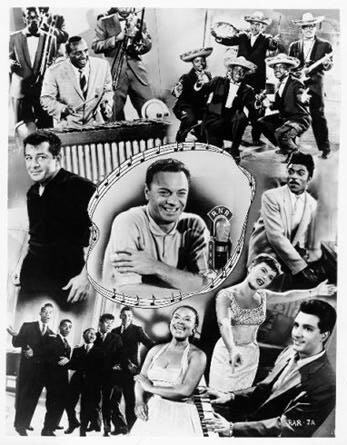 In 1951, Cleveland, Ohio disc jockey Alan Freed began playing this type of music for a multi-racial audience. Freed is credited with coining the phrase "rock and roll" to describe the rollicking R&B music. Freed called himself "the Moondog" and billed his show as the "Moondog Rock ‘n' Roll Party." While working as a disc jockey at radio station WJW in Cleveland, he organized the first rock and roll concert called "The Moondog Coronation Ball" on March 21, 1952.The audience and the performers were mixed in race. 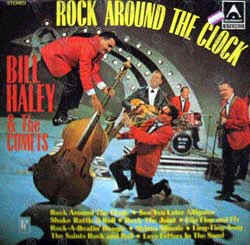 Bill Haley's "Rock Around the Clock" (1954) became the first rock and roll song to top Billboard magazine's main sales and airplay charts it was featured first in the movie "Blackboard Jungle" and then in the movie "ROCK AROUND THE CLOCK"
Little Richard is an American singer, songwriter, and pianist. Richard Wayne Penniman was born December 5, 1932 one of twelve children. His father Charles "Bud" Penniman was a Seventh Day Adventist preacher. Richard grew up on a dirt street in an impoverished section of Macon, Georgia. An early pioneer of rock and roll music, Penniman's hit songs of the mid-1950's, under the stage name 'Little Richard', laid the foundation for rock and roll music. Little Richard's early work was a mix of boogie-woogie, rhythm and blues and gospel music, but with a heavily accentuated back-beat, funky saxophone grooves and raspy shouted vocals, moans, screams, and other emotive inflections that marked a new kind of music. Little Richard rocked the charts with hits, such as Tutti Frutti","Long Tall Sally", "Rip It Up". "The Girl Can't Help It", "Slippin' and Slidin'", "Jenny, Jenny", "Good Golly, Miss Molly", and "Keep A Knockin'". Little Richard is still rock n' and a rollin -if you get a chance go see him- if you can't -buy some of his music. Charles Edward Anderson "Chuck" Berry (born October 18, 1926 in St. Louis, Missouri) is an iconic and influential African-American guitarist, singer and songwriter. 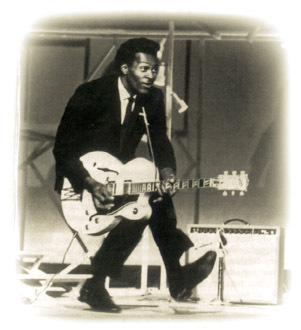 Chuck Berry is an influential figure and one of the pioneers of rock and roll music. According to the Rock and Roll Hall of Fame's website, "While no individual can be said to have invented rock and roll, Chuck Berry comes the closest of any single figure to being the one who put all the essential pieces together. It was his particular genius to graft country & western guitar licks onto a rhythm & blues chassis in his very first single, “Maybellene.”"
A pioneer of rock and roll, Chuck Berry was a significant influence on the development of early rock and roll guitar techniques and a major catalyst in the rhythm and blues to rock and roll transition. He was the first to define the classic subjects of rock and roll in his songwriting; cars, girls and school. His guitar style is legendary and many later guitar musicians acknowledge him as a major influence in their own style . 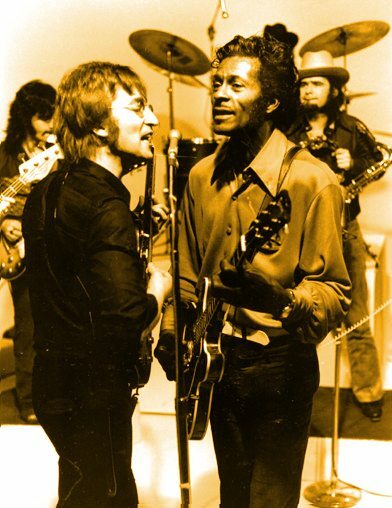 John Lennon stated: "If you tried to give rock and roll another name, you might call it 'Chuck Berry'." Elvis Aaron Presley (January 8, 1935 – August 16, 1977), often known simply as Elvis and also called "The King of Rock 'n' Roll" or simply "The King", was an American singer, musician and actor. He remains a pop icon and is regarded by some to be the most important, original entertainer of the last fifty years. n the 1950s era of blatant racism, Presley would publicly cite his debt to African American music, pointing to artists such as B. B. King, Arthur "Big Boy" Crudup, Jackie Wilson, Robert Johnson, Ivory Joe Hunter, and Fats Domino. Many people in the "establishment' considered Elvis "A danger to American culture." Elvis had been accused of "stealing" black rhythm and blues, but such accusations indicate little knowledge of his many musical influences. However much Elvis may have 'borrowed' from black blues performers , he borrowed no less from white country stars and white pop singers, and most of his borrowings came from the church; its gospel music was his primary musical influence and foundation. Of all the requests made each year to the National Archives for reproductions of photographs and documents, one item has been requested more than any other. 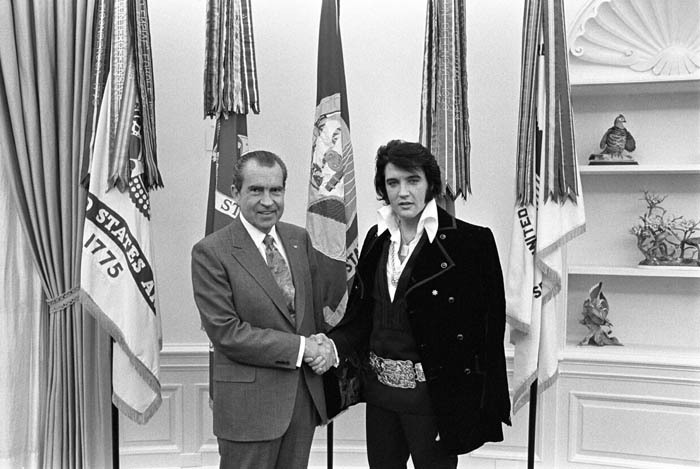 This item, more requested than the Bill of Rights or even the Constitution of the United States, is the photograph of Elvis Presley and Richard M. Nixon shaking hands on the occasion of Presley's visit to the White House.